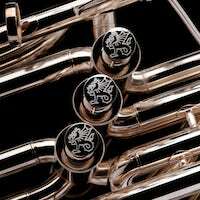 Voisi1ev wrote: Curious, are the traditional 3+1 Eb and Bb horns being discontinued? In fact the new 3+1 Leviathan BBb will be out later this year. The ultimate brass band BBb bass! A comp BBb, suitable for brass bands, but front action - would this not solve some of the ergonomic issues with these instruments? Is a larger "Anton" model in the works for 2019? 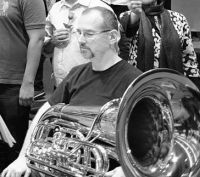 danontuba wrote: Is a larger "Anton" model in the works for 2019? Are there any plans to bring the Wessex models to Canada and specifically to the west of Ontario? This country's size and the need to drive very long distances would make a visit by Wessex to a city such as Vancouver or Calgary really appreciated. Thank you! The Gnagey Eb Tuba fits your bill of a 17" bell. It's primarily only in the low range that you would need to use the 5th valve as opposed to the 4 compensating valves on the Cavalry. Both are front action, so you wouldn't need to learn 3 + 1 fingerings. You mean Cavalry, right? Or is there a Jesus Tuba now? I'd like to see the Gnagey with rotors. Or any other bigger rotary E-flat. The Danube should have been bigger, with the Berg being as good as it is. I'll just throw this out there... a rotary version of the Chicago Presence. Last edited by Wyvern on Wed Apr 25, 2018 8:59 am, edited 2 times in total. cktuba wrote: I'll just throw this out there... a rotary version of the Chicago Presence. That is also an idea which as Neptune owner I find interesting, but won’t happen this year. Too many other development projects underway! How is the Piston F idea looking? dasanchezr wrote: How is the Piston F idea looking?